The latest information and analysis confirms that MH370 will be found in close proximity to the arc set out in the map and labelled as the 7th arc. 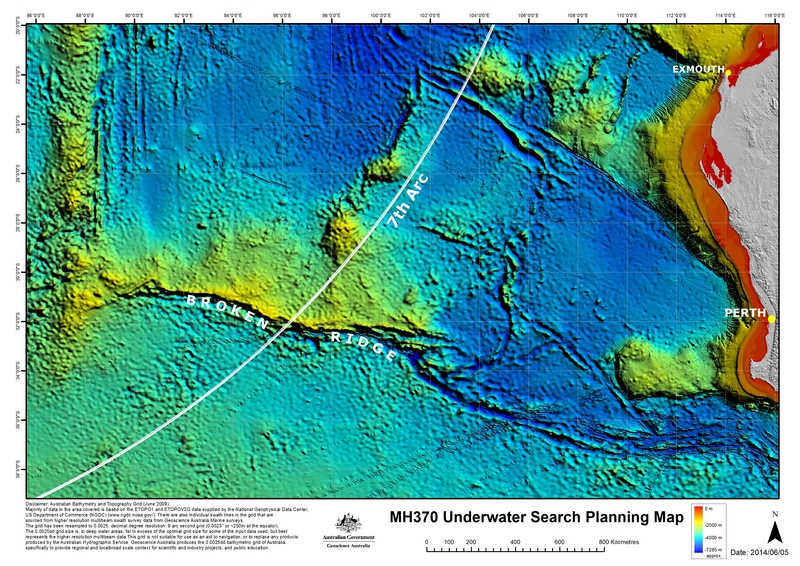 At the time MH370 reached this arc, the aircraft is considered to have exhausted its fuel and to have been descending. As a result, the aircraft is unlikely to be more than 20 NM (38 km) to the west or 30 NM (55 km) to the east of the arc. Based on all the independent analysis of satellite communications and aircraft performance, the total extent of the 7th arc reaches from latitude 20 degrees S to 39 degrees S.
Refinement of the analysis in the coming weeks will reduce the underwater Search Area along this arc to a prioritised 17,500 sq. NM (60,000 sq. km). The prioritised length of the Search Area along the arc is expected to be 350 NM (650 km). More information about the Search Area will be made available as soon as it is verified.